Well, I had sworn not to grow potatoes again after the Blight Year of 2009 – my first year gardening. It wasn’t just blight that ruined that year’s potatoes (the tomatoes didn’t suffer too much). I also tried the potato tower method and it was Spudtacularly Disappointing. 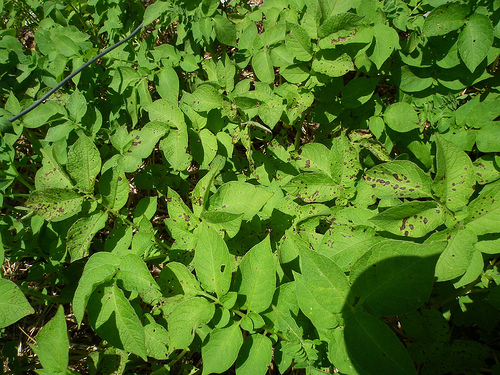 It’s a form of Potato Leaf Blight, caused by the fungus Alternaria alternata. Luckily it’s less aggressive than its cousin Alternaria solani (the Early Blight fungus). You can read more about it, and its difference from Early Blight, here. 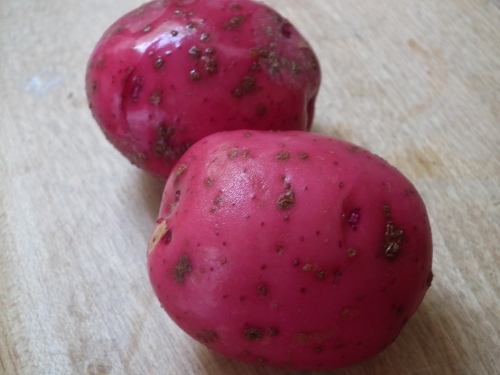 Tubers affected by Early Blight don’t look like this at all. This looks like Black Pit, the tuber phase of Brown Spot. Don’t they just sound like two brothers, one kind of sweet, like a cudly dog, the other kinda mean, like a devil? 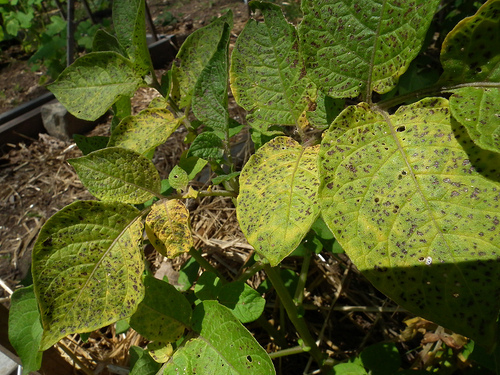 Mm, I can’t find a picture of it through Google (this site says Brown Spot and Black Pit are less well known potato diseases), so I can’t say for sure. 2 lb 12 oz of Banana Fingerlings / 3:2.75 – Yikes! So… Fingerlings were a bust, but the Dark Red Norland did okay. I have good hopes for the Keuka Gold, which had the best yield in 2009 and which held our loner – the roller coaster of heat and rain was hard on the plants, but no sign of this disease at least. I’ll harvest those once my present stash of potatoes is finished. Anyways, I’ll be planting three beds with more green beans, new carrots and greens, maybe even some more cukes. And we’ll be eating lots of baby potatoes over the next couple of days. I have no objections to that. 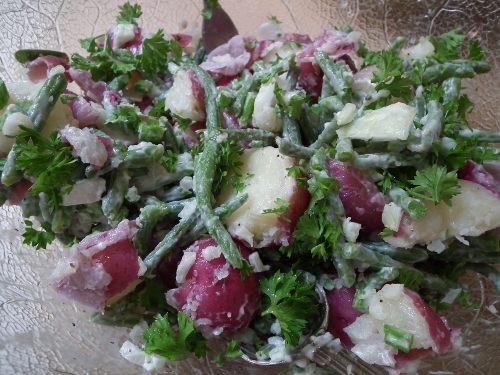 Your potato salad looks yummy. We’re potato lovers too and so far haven’t had terrible problems with disease. I’m glad you didn’t give up! Can you still eat the potatoes if they babe brown spot?